For the last several years we have been observing the development and formation of the smartphone market. Let's remember earlier we had to pay for more functionality with greater size (much bigger than in usual phones), overpricing and short battery life. Then all these problems were overcome step by step, but the development hasn't stopped. If looking at the smartphones in a year, they will reach the communicator functionality - this very thin border between smartphones and communicators will disappear completely, technological disputes about what a smartphone and a communicator are will come to naught, the terms will become synonyms finally. And why can we assert the border will vanish? The main difference between a smartphone and a phone is the first one has an open operating system, which allows installing programs by your wish. 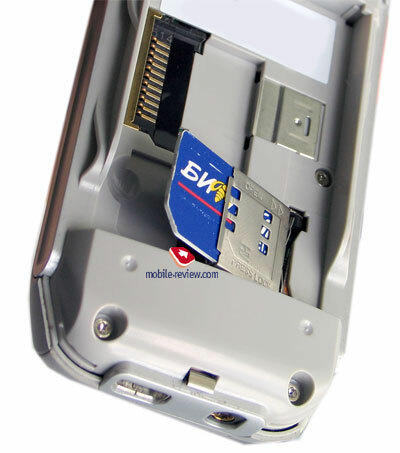 The main players on the smartphone market are Nokia Series 60 and Windows Mobile for Smartphone. And correspondingly the main makers using the systems are Nokia and HTC. The others do not have a leading role on the market. Both known companies will equip their future devices with Wi-Fi (VoIP telephony being the main way of use, cheaper calls) and satellite GPS receivers, finally, sensory screens will appear. And thus smartphones gain not the features usual for communicators. So, smartphone and communicator specs will meet in a point. The differences will include form-factor, size, as well as it is for notebooks, subnotebooks and Tablet PCs. As we have already said a Taiwanese company of HTC (High Tech Computer) is the main maker of Windows Mobile smartphones. Unlike Nokia the name of HTC tells little to users, and that's why we'll give some explanation. A Taiwanese HTC is Microsoft's Hardware platform development partner. The company has released the fifth generation of smartphones and communicators already. As for handhelds, the majority of today Pocket PC PDAs are issued from HTC's pen (HP iPaq, Dell Axim, Fujitsu Siemens Pocket LOOX). The company products appear under various trademarks (against ODM contracts) of operators and other companies, they include T-mobile, Orange, O2, Vodafone, Qtek, I-mate, Dopod and others. 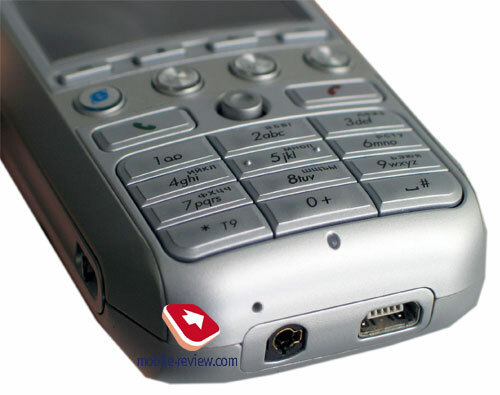 For instance, one of the HTC's models (the Typhoon) is sold under the following brands: Qtek 8010, Qtek 8020, I-mate SP3, I-mate SP3i, T-mobile SDA, T-mobile SDA music, Orange SPV C500, O2 Xphone II, Audiovox SMT 5600, Dpod 565 and sme others. Thus, the name HTC is unknown only to usual people, and specialists are well acquainted with it. 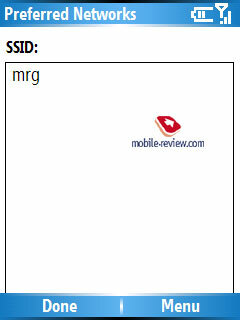 Not to confuse our readers we'll call the devices by their internal code names. And today we test HTC Tornado. An interesting fact is HTC gives the names of natural disasters to its smartphones. We saw the "hurricane" and "typhoon" before the "tornado", and future smartphones will follow the tradition of "natural" names. Note, the Hurricane is a platform (or a playform in the company's terminology), it sets specifications for the device, and body material, design, the number of control elements may vary inside a certain platform. When the design and body materials are confirmed we get a product. We had HTC Riemma and Riemma Music (particularly this design and material of the body). So, we can say HTC Riemma is one of the Tornado platform versions and belongs to Hurricane family. This very device will appear on the counters under the following trademarks: Qtek 8300, Qtek 8310, I-mate SP5, I-mate SP5m, T-mobile MDA II Music and many others. 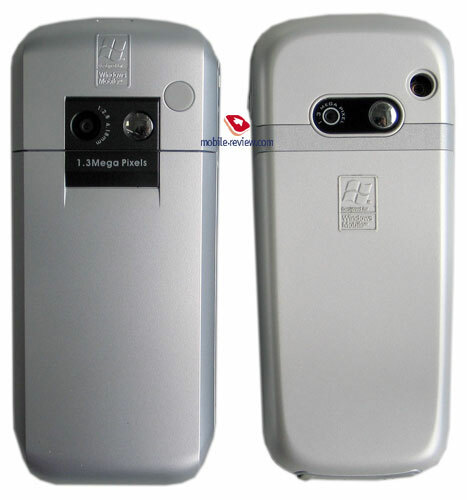 As we have mentioned before, HTC Tornado platform belongs to the fifth generation of HTC smartphones. Let's see how the products developed. First generation. A code name - HTC Canary. That was mainly a pilot product to show itself. For the launch moment Windows smartphones were almost absent. The market treated the product coolly, the absence of Bluetooth and a camera and a big size prevented from accepting it well. There were too little people who believed in Microsoft's OS success, that was the middle of 2003. Second generation. A code name - HTC Voyager. The platform is considerable elaborated. The design has not changed any significantly, but a new OS version is used, the screen in much better, camera and Bluetooth are added (integral attributes of a today smartphone). The model is accepted enthusiastically, and the number of ODM partners of HTC grows. Third generation. A code name - HTC Typhoon. Break. Battery life is significantly increased; the size equals the one of today business phones. A new version of the OS and transfer to miniSD. That was one of the best smartphones in 2004, and only Nokia 6630 could compete. And as for the battery life and the size, the Typhoon has no equal. That was the first time the company started offering various design versions within the one platform - HTC Feeler, HTC Sonata, HTC Amadeus. HTC Robbie. The front is of anodized aluminum, extra buttons to control a musical player. HTC Nobel. A stricter business version without extra musical buttons, the body is of plastic. HTC Riemma. Our today reviewed smartphones - Qtek 8310, Qtek 8300. Two variants - business and musical versions - exist. HTC Faraday. The same Riemma without Wi-Fi. The musical version of HTC Tornado (Qtek 8300, in our case) generally copies HTC Robbie n appearance. The design is stricter, straighter lines; no narrowness to the bottom, the model is a bit thicker. Now HTC still prefers avoiding such experiments with design as Nokia carries out. HTC still produces candy-bar phones, clamshells and sliders are in the company's plans for the next year. The size is not significantly bigger than the previous model has (109x47x18 mm), a bit losing to today business phone models. The device may be carries like a usual phone - even in a shirt pocket it will make no troubles. The weight increased due to greater size - now forming 121 g. The face and back are slightly projecting - thus the thickness vary from 18 to 20 mm. This concerns a protective screen (the image doesn't change due to that in no way) and a number key row. The main part of the body is of anodized aluminum pleasantly cooling your hand. He rest body parts are of an expensive silvery plastic. The battery cover is of plastic and is not made of metal to decrease the weight. The device is felt like a solid thing, making a general pleasant feeling. The assembly is traditionally qualitative - even pressing hard you will observe no backlash. Solidity is a single word for the impression of the body, the same as for the previous model. We should note, the anodized aluminum supposes careful treatment - you shouldn't carry the device is a trousers pocket with exterior things - the covering is quickly rubbed away, the best way is to carry it in a case or a pocket of your jacket. 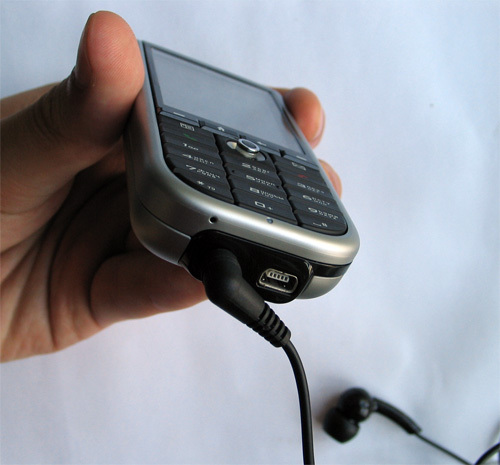 Speaking about a business version HTC Tornado (Qtek 8310), we can say it slightly differs from the "musical" one. No extra musical buttons, and the design is even stricter. The size forms 109x47x19 mm (the front and back panels are not projecting at this time). The body is plastic (the combination of black an silvery), and thus the weight is lighter - 109 g. By the way, a plastic body demands less careful treatment than of anodized aluminum. Despite slightly grown size and weight, HTC's products are the minimal on the market (among candy bars, not clamshells). Comparing Nokia 6681 to HTC Tornado, we see the last is wining. Thin system buttons are placed just under the screen. Two soft-keys, a "home" button (to turn back to the start display) and "back". They can seem uncomfortable to work with due to their narrowness. That is wrong; you'll get used to them at once and feel no discomfort (in both design versions). Below a row of specialized "musical" buttons is placed (in a musical version), and only the left button role can vary from model to model, and the one we had called Internet browser. The other three keys are responsible for music play back (by the way, they understand both short and long pressures, the result depends on it). You can't assign personal functions to the musical keys by standard means, so by default they are used only for music. The functionality s exceeding - if the player works in background, then pressing one musical button first calls the player, and the second pressure is responsible for actions, these actions are fully duplicated with the joystick. The joystick is comfortable both while playing games and working with usual applications. 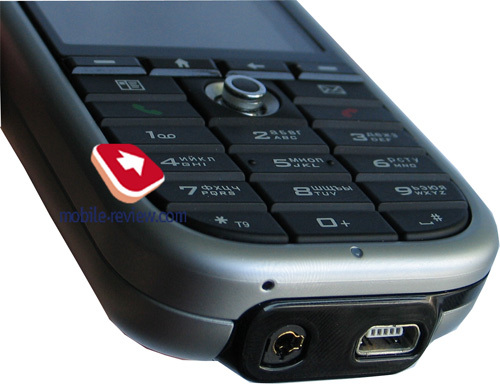 Three was no room for a large rocking button like in HTC Typhoon. "Musical" buttons crowded the number block down to the very bottom of the body. Though, it's hard to call comfortable, you should get used to it. While entering a message you'll have to hold the very bottom of the smartphone. The musical version possesses the same uncomfortable keypad as HTC Robbie. As we have already mentioned the number row is projecting, and besides, every button s also projecting. The keyboard backlighting is even, it turns on only at poor light, which is to economize the charge. And the opposite situation with a business design. The joystick is slightly more comfortable and more projects from the body. More room is given to number keys, since no musical row is present. The keypad is a bit more comfortable - the keys are larger, have a better motion, exact response at pressure. 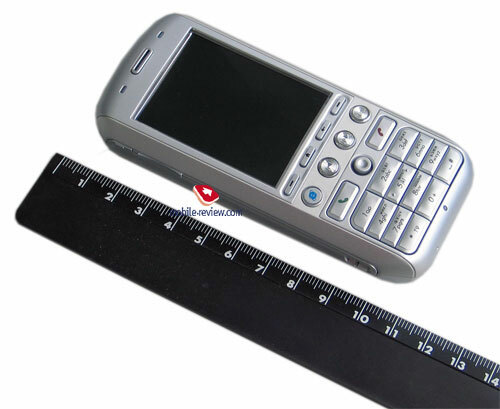 The comfort of use and ergonomics put the device to the one line with Nokia 6681, Samsung i300. The disposition of the other control elements is inherited from HTC Hurricane. Above the screen there is a loudspeaker for conversations and two light indicators on both sides of it. On the top we see IrDA and a power button which is responsible for profiles also (short pressure, here you can select "aboard a plane profile"). A single camera button is placed on the right side, and an Internet Explorer button is on the left (its responsibilities vary from model to model). A coupled loudspeaker volume button took its place nearby. Side buttons have a reasonably tough motion to prevent from accidental pressures. A camera gap and a battery compartment are on the back. The camera capabilities completely copy HTC Hurricane. You can refresh the material in your memory. The bottom of the device collected usual set of elements - a small microphone gap is here, it allows recording sound with good quality, miniUSB connector to connect to a PC, the device is charged from USB. The same slot is used for a charger; the makers refused a rubber shutter. A standard smartphone headset connector of 2.5 mm is placed here. There is no a rubber shutter, as for me, this is to the better, since a folded shutter with a headset attached looked not as good. But the quality of the music in the earphones is high; the smartphone can be surely used as a musical player. If discussing the smartphone in this role, we can stress several points. The max capacity of available memory card is 1 GB. You can write files via Active Sync (too long) or turn the device off, remove the battery and write on the card directly using a card reader. The absence of hot card change is a disadvantage as compared with Nokia smartphones. The absence of the USB Mass Storage function (accessing the card from a PC without any drivers, for instance, the function is available in Samsung i300) is also a minus. The removable Li-Ion battery is capacious of 1150 mAh, which is not bad. The battery life announced is five hours in the talk mode and ten days in the standby mode. The results of our tests show stable work for 2-3 days in Moscow under the condition of 20 minutes of talks, accessing the Internet via GPRS (an hour a day), several hours of listening to the music and other functions a day. By personal feelings the battery life has not changed as compared with HTC Hurricane. 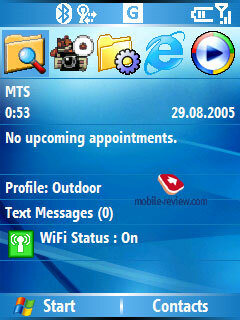 At the same load Nokia 6681 works for a day or a day and a half. The device worked for 7 hours 25 minutes at the maximum load (phone module is off), non-stop music from the memory card (the screen is off, the "aboard" profile) discharged the battery completely in 18 hours. Reading a book with autoscrolling allows 15 hours of use. The table shows comparison with other smartphones. The results are among the best for non-touchscreen devices, note the battery life increased as compared with HTC Hurricane (probably, due to the new processor). 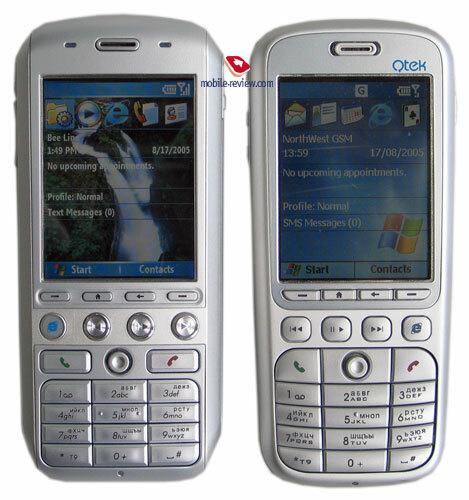 Nokia 6681 greatly distinguishes to the better - the minimal screen backlighting is very low (the minimal turn work of the processor), "aboard a plane" mode, no memory card. However HTC's smartphones can't give such results in a reading mode - the backlighting is not regulated, and it is the very thing consuming the most charge. 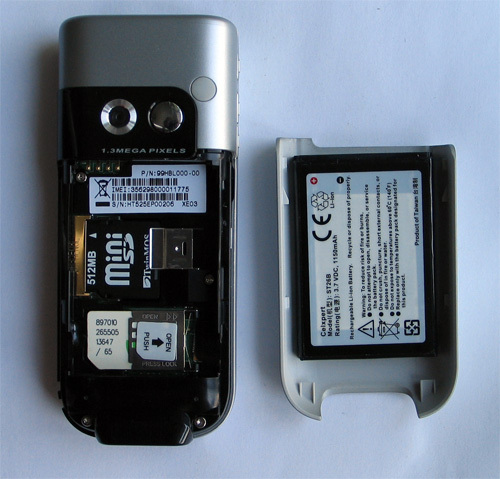 A SIM-card and miniSD holders are placed under the battery, they completely copy HTC Hurricane's ones. We have told about the card above and won't repeat here. 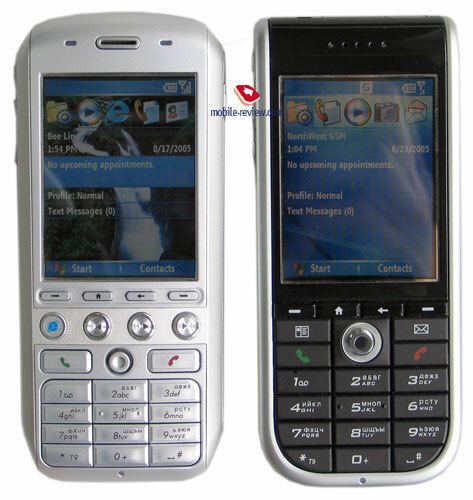 The model uses exactly the same screen as HTC Hurricane - TFT, 320x240 pixels (QVGA) screen, which is the main advantage of the device. 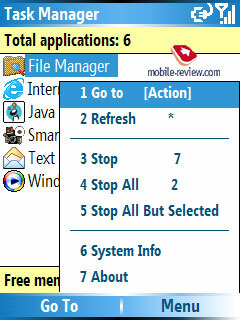 This resolution was available for only Pocket PC devices before. Later it will become standard, and now these are the first signs. The image became more exact and detailed with the same screen diagonal; working with it is comfortable (roughly speaking the number of the pixels doubled). We committed a little research in the target group (people who choose and buy smartphones on purpose). And it turned that about a half of the participants called HTC Robbie one of the main pretender to buy (Internet surfing, full-screen video were shown). Let's compare the screens with the rivals, and everything will get proper. Physically the screen is capable of 262K but shows 65K colours due to the OS constraints. The image is seen almost at any angle, the colours are not inverted and don't fade. It behaves well in the sun, the picture fades, but the text is still readable. 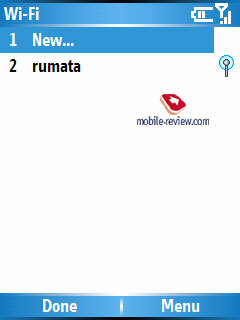 And the only one smartphone offers a better screen, which is Nokia N90 recently appeared in retail. Access to media content (at home, for instance). Both fast access to the network files (quick MP3 download from operator) and receiving online broadcasting (music, radio, video). You can realize stream music broadcast from your desktop. Internet telephony - free calls via the Internet. 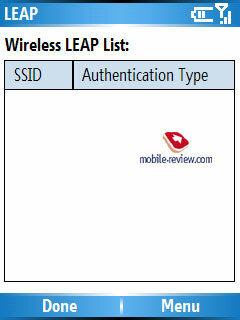 Operators can use it for sutureless switch between GSM and Wi-Fi. For instance, the conversation is started in the street using GSM, accessing the home Wi-Fi network you have your voice automatically switched to Wi-Fi, the tariff is cheaper, and the switch process is insignificant. 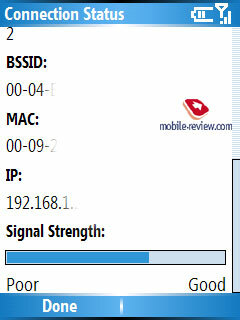 Undoubtedly, the smartphone is to be in a coverage zone of one of the Wi-Fi access points then. 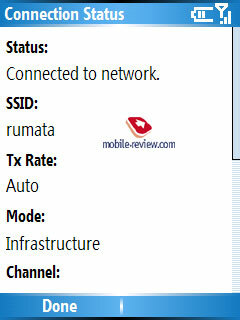 Let's see how the Wi-Fi module is realized in HTC Tornado, which capabilities it has. 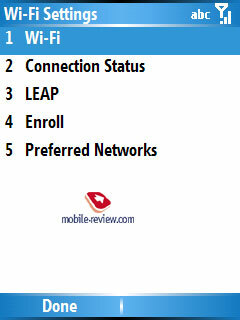 The start screen shows the Wi-Fi condition - on or off. Pointing and pressing the status bar, we get into Wireless Manager, which allows both adjusting Wi-Fi and Bluetooth (by the way, both modules can work together). 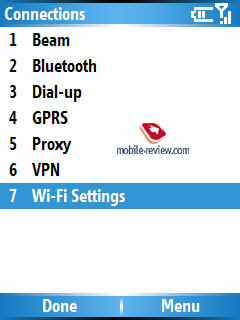 Wi-Fi settings are enough - all the necessary parameters are available, both WEP and WPA are supported. Setting causes no problems - the smartphone connects to all the access points with no problem. Internet pages open almost in no time (especially those adapted for a PDA), the data transmission speed is enough for a smartphone. You can listen to the online radio using an integrated Windows Media Player. 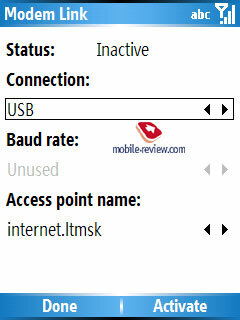 For instance, you can make broadcasting within a home wireless network (for enthusiastic users, not usual ones). You can't see system folders - smartphones have no corresponding applications developed yet, but that is a matter of time. Finally, no VoIP client is developed for a phone version. No programs are available. The Skype for smartphones includes only text messages, not voice services. And again, the appearance of VoIP clients is a matter of time, since HTC Tornado is the first smartphone with Wi-Fi, no need in such programs was experienced before. Thus, for the launch moment there will be no way to use Wi-Fi fully, though corresponding programs will appear in some time. On the other hand, operators developing Wi-Fi networks will have an unlimited space for extra services. Now, probably, that is all for Wi-Fi. Headset is working with a wireless headset. We found no problems during our tests. The audibility is good. Voice dialing is available with prerecorded tags. Voice dialing works with no cavils. An interesting thing is when you leave the coverage zone, the headset starts peeping periodically, signifying the network is not available. Object transfer. 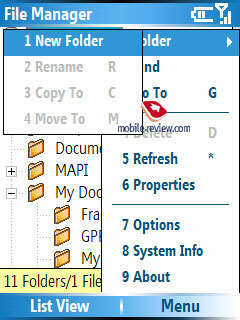 You can transfer contacts, calendar entries to other devices and receive them as well. However you are not allows sending tasks and audio tags. You can receive or send any file, but the File Transfer service is not supported completely: only one file in one time unit. Emulation of COM connection is supported, synchronization of Active Sync via Bluetooth causes no troubles as well as connection with a Bluetooth GPS receiver. 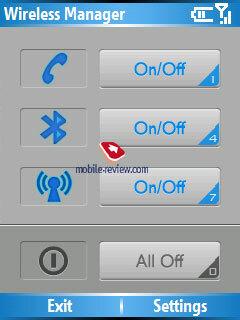 Here are all the Bluetooth capabilities. The disadvantages result from the limitations of the integrated drivers by Microsoft - the settings are almost absent, FTP profile is not provided, not Bluetooth stereo. Internet connection via GPRS is established without any problems. The EDGE support appeared, but the function really is demanded only by an insignificant part of the target group (most often the operators don't support EDGE, or GPRS capabilities are quite enough for data transmission). However, the model is very suitable for those operators which have already provided support for EDGE, or plan to do it. 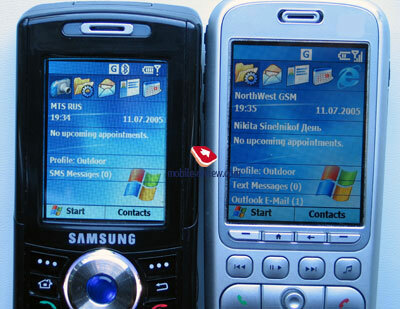 The smartphone is run by Windows Mobile 5.0 for Smartphone, its standard capabilities will be reviewed on our site. And here are third party programs for it. MIDlet Manager. Following the name, that is a utility to launch Java programs. Not all the available programs do work. 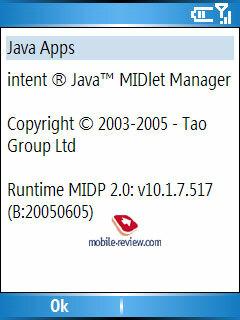 No Java 3D, version MIDP - 2.0. MMS. Create a multimedia message. Everything is clear. Clear Storage. 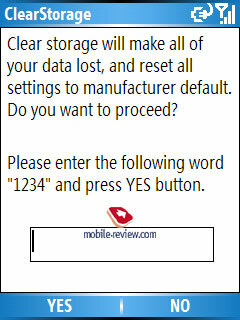 Complete formatting of the smartphone memory, hard restart. 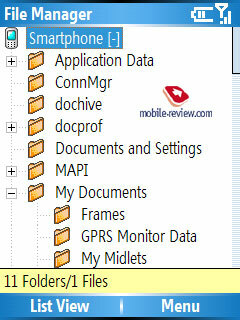 File Manager. A convenient file browser. 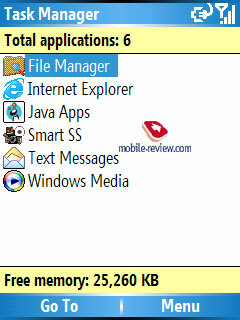 Extracts ZIP archives and shows system data (the left charge in per cent, free memory). Modem Link. 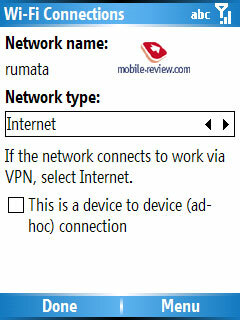 Allows using the smartphone as a modem. Possible connection types: USB, IrDA. Task Manager. Task Manager shows running programs. Unnecessary ones may be closed to free memory. Also you can see system information. 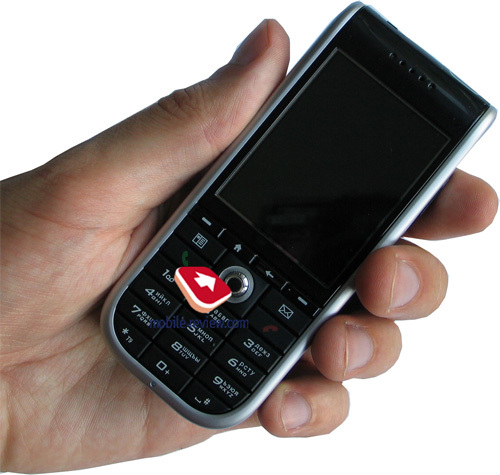 The smartphone is based on Texas Instruments OMAP850 with the max clock rate forming 200 MHz. The clock rate is changed automatically depending on the current load. 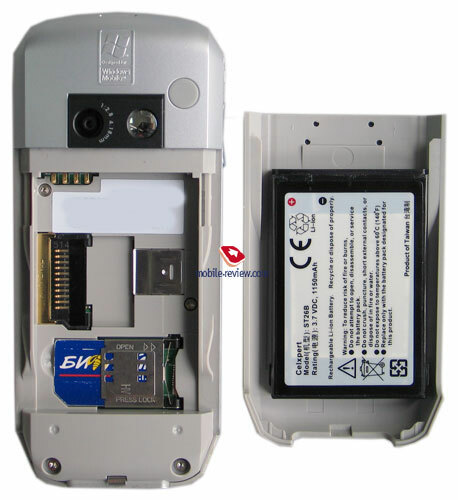 The available flash memory forms 14.92 MB (all the user data is kept there), which is about 10 MB less than in HTC Hurricane, memory card is necessary here. 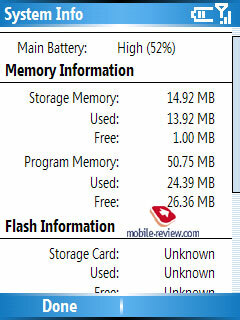 Available RAM forms 50.75 MB (usually not more than 35-40 MB is free of this capacity, RAM size rarely falls under 20 MB). 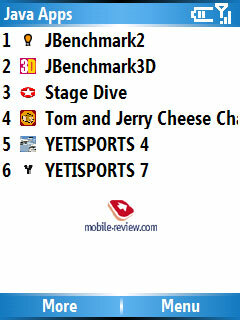 Here are the JBenchmark 2 test results. We see HTC Tornado surpassing all others, but we won't make any conclusions since the results greatly depend on the Java realization on a certain device. You see HTC Hurricane surpasses other products, but we won't make conclusions of it, since the results depend on Java realization on a certain device much. Video was tested using The Core Pocket Media Player (a former BetaPlayer), so, the results are the following. Productivity level of about 100% means the film is shown averagely without frame falls, smoothly, however, collapses at active scenes are possible. So, you can watch films on the smartphone after a special conversion, the productivity is enough. And if HTC Hurricane worked not as fast due to the grown number of pixels, then this smartphone is much faster than the predecessor, which is not seen only from tests but by subjective feelings as well while working with the menu, integrated applications. The speed doubled as compared with HTC Hurricane. The quality of connection rouses no complaints - it is a good average one, though losing to Nokia 6681 (the difference is noticeable in poor coverage conditions, and is unnoticeable in good coverage). The volume of the integrated loudspeaker and the vibra power are average. Setting an MP3 composition as a call melody you'll hardly miss a call. The new HTC's model is the first smartphone with Wi-Fi integrated. Its hardware implementation is very good, but there are no applications to realize all the capabilities of the module. The main pluses of the model are miniature size for a smartphone, long battery life, qualitative screen of high resolution and high speed. This model is unreachable till the end of the year in a combination of these parameters. Undoubtedly, disadvantages are present - not the best camera, no flash, no hot card change, and the absence of 3G. 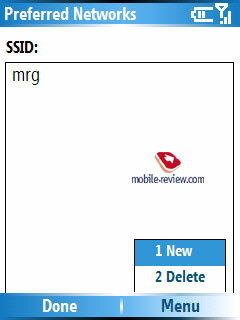 Now the only rival on Windows Mobile is Samsung i300. Direct comparison seems incorrect, since the Samsung's model is larger, has an integrated hard drive and a wheel. They are in different price segments. Today in retail HTC Tornado sold without a contract costs about 500-530 USD (FOB price - 430 USD). The launch is planned for the end of October - the beginning of November. 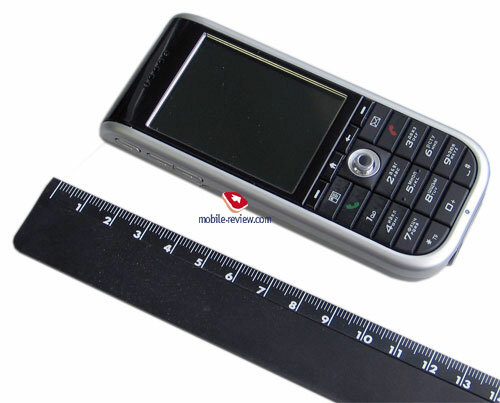 Nokia 6681 is sold for 450 USD (FOB price of 410 USD). HTC Tornado (a business version of HTC Tornado - Qtek 8310) is one of the most likely pretenders to "a smartphone of the year".